I love porridge! Ever since I was a small boy I would eat as much of it as I could. Over the years I’ve learned a thing or two about how to make good porridge. Good quality oats are essential. Often with pre-packed plain oats with guaranteed cooking times of “porridge made in two minutes” are just wrong in my book. The oats have been ground up so small as to reduce the cooking time, that the texture and overall flavour of the oats is insulting. This is what coarse oats look like. They’re much bigger, fuller than the sawdust which passes as porridge in most packets. These oats will require a slightly longer cooking time, but they absorb much more water, and have a distinct nutty-flavour. I recommend good oats. The above are Mornflake oats. But I suppose anything labelled as “Jumbo” oats would do equally as well. This is the important bit: consistency. Yes, it’s all about personal preference, but I personally don’t like runny porridge. I like really thick porridge; I want the oats to taste of something and still have a bite. Whatever your personal preference it’s important to measure the quantities. 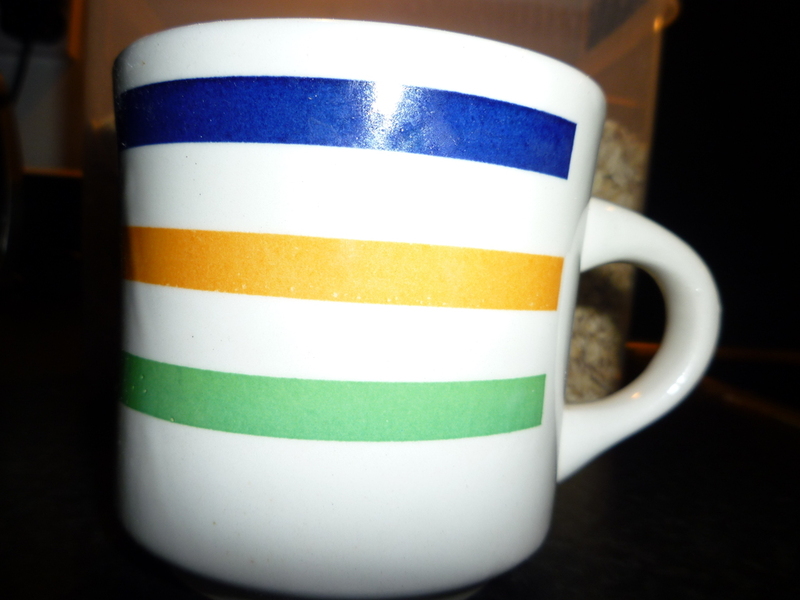 This is something I find best done with a mug – I even have a special “porridge mug” which measures out both the porridge oats and the liquid. It’s quite a small cup, but I’ve found it perfect for one person’s worth of porridge. The ratio of oats to liquid for me is 1:1.5 – that is, one cup of oats has 1.5 cups of liquid. The choice of liquid is equally as important. Traditionalist will say to use water, and I’d personally agree with them. The choice of water is often important too. Some people swear by a certain type; I’m blessed with Southampton’s finest, which is quite a hard water but I like the taste of it. Using plain water just helps bring out the flavour more of the oats. Most people will use milk – I don’t like this myself, but it does make the oats taste creamier. One final important thing is to add a good pinch of salt. This isn’t for flavour (unless that’s what’s intended, but would be odd) but to enhance the flavour of the oats. I use sea-salt for this. Cooking porridge should be a slow process to give the oats time to soak up the liquid. Some people will in fact soak their oats overnight before they cook them. I don’t bother, allowing about thirty minutes to cook my oats. Using a microwave is committing porridge sin. A microwave all but destroys the oats and their texture, making the porridge a mass of hideousness. 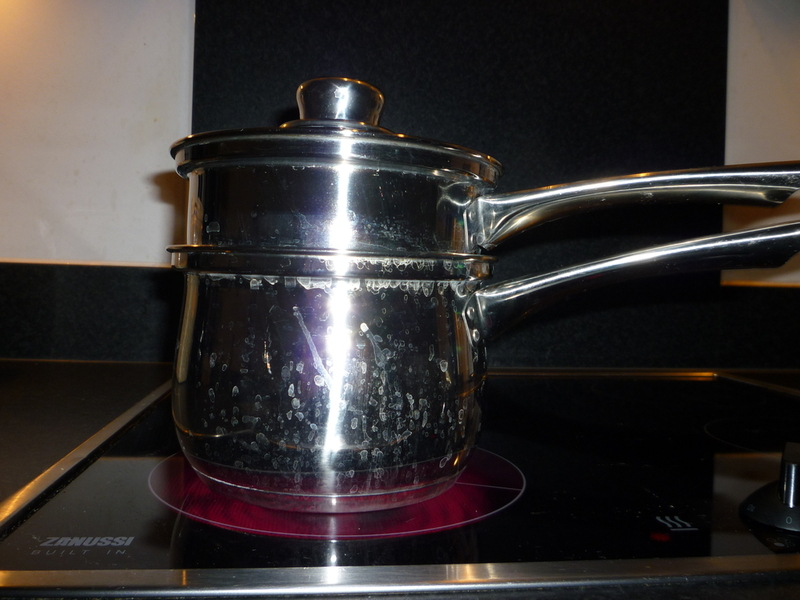 I urge anyone thinking of using a microwave to stop, and switch to a saucepan at least, but keep reading as to why even this is not the best thing to do! This one is stainless steel which is OK, although you can also get glass ones. As with a bain-marie, this is nothing more than a pan within a pan. 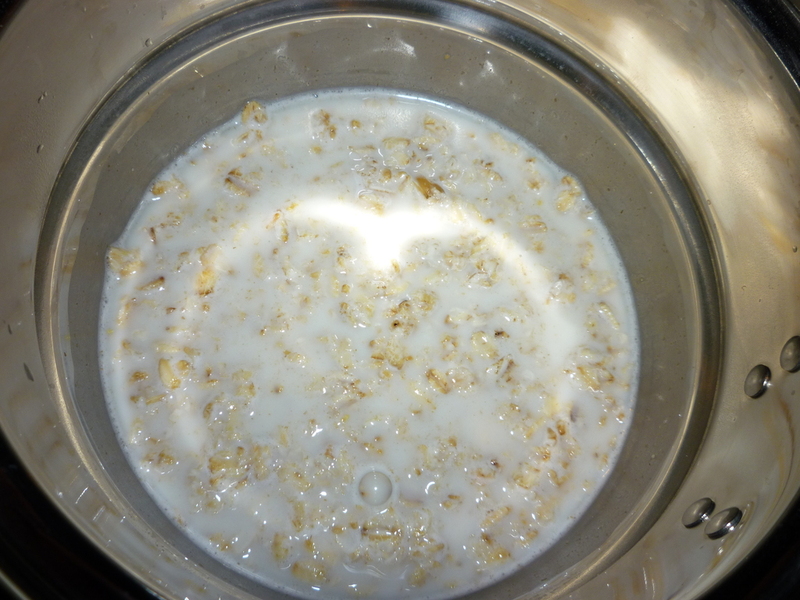 The larger pan contains an amount of water, and the top pan contains the actual oats and liquid. And because the heat comes from the water, this allows the oats to cook a lot slower – which won’t degrade the oats, will help keep their shape and texture, and allow the oats to soak up the liquid. Because I like to cook the oats slowly for this reason I don’t heat the water up first. Instead, I assemble all of the ingredients in the top pan, and put it in the bottom pan and then place the whole thing on the stove on a low heat. After about ten minutes, I will stir it once, and then leave it for another ten minutes and stir it again. All the while keeping it covered with the lid. This shows the cooking time of the oats after about fifteen minutes. You can see even on a low heat that some of the liquid has been absorbed. The white liquid is mostly starch – it’s not milk. Stirring the porridge is equally as important. For this, I use a device called a spurtle. 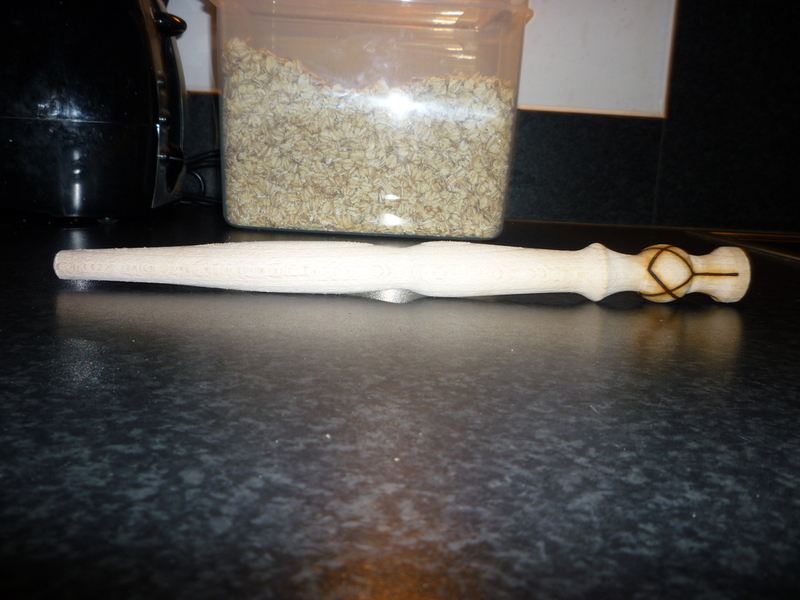 This is essentially a wooden stick, but designed specifically for stirring porridge. The reason it’s important is it ensures an even stirring of the oats. A wooden spoon (which can be used in a pinch) isn’t as good as this, as the paddle at the end won’t shift the oats in the same way. It’s important also not to overcook the oats. 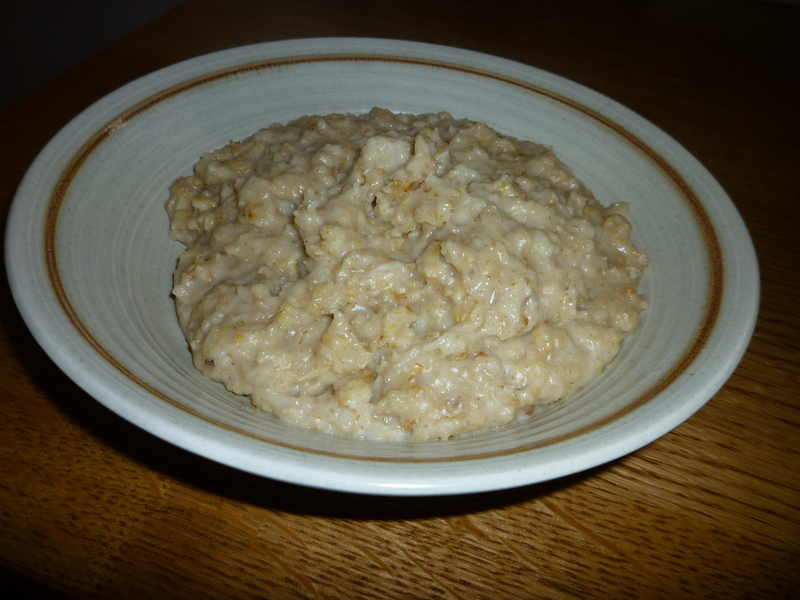 So many people have been put off porridge as a child, remembering the gloopy mess their parents served up. That’s because the starch started to break down. 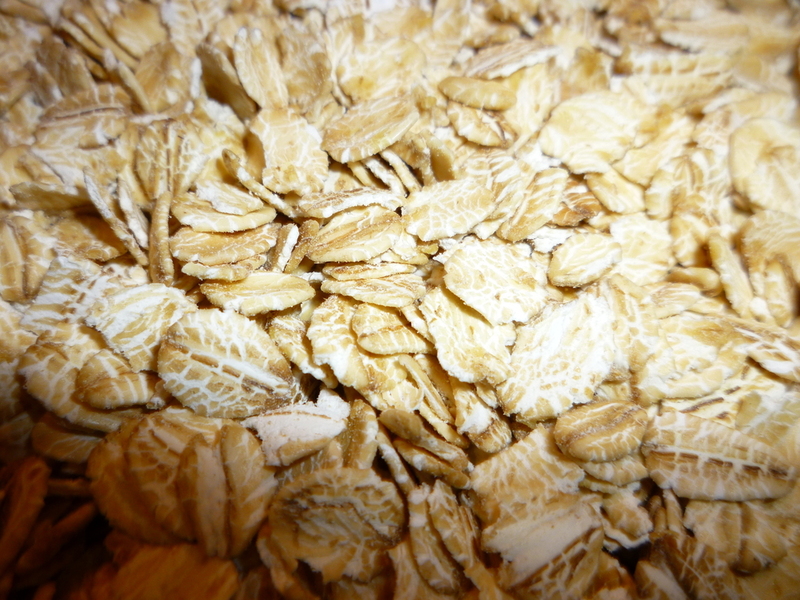 The oats should still have a slight bite to them; and the way to test this is during stirring; as the oats start to thicken it will become more and more difficult to stir them. And it’s at that point that the porridge is either ready, or very close to being ready. Obviously part of this depends on the preferred thickness of the porridge. Even after cooking, it’s important to let the porridge stand for about two minutes. As it cools it’s still cooking and it’s important to give the oats a chance to rest. Porridge has become so very popular in Scotland (and other areas) that every year, a group of porridge enthusiasts get together to celebrate this wonderful food. Yes, there really is such a thing as [World Porridge Day http://www.goldenspurtle.com/world-porridge-day/] and it takes place every year on the 10th October. There is also the World Porridge Making Championships – better known as the Golden Spurtle awards which take place every year near to World Porridge Day where people get together and compete to make traditional porridge, and oat-related things, where they’re judged, etc. The lucky winners receive a Golden Spurtle trophy in recognition of this. The whole event takes place in the lovely village of Carrbridge, deep in the middle of nowhere in Scotland. But using a microwave reduces my time in the morning. I’m busy enough as it is! So? They say that breakfast is the most important meal of the day, and I therefore /make/ the time to ensure I get a decent bowl of porridge. Why are you so fanatical about porridge? Because it’s both so simple and wonderfully versatile that I rather like that combination. Best of all though, it’s tasty! You’ve changed my life, thank you! You like [teddy bears ./teddies.html] as well as porridge? Porridgelady - she likes porridge almost as much as I do!